The unseasonably cold weather continued Saturday at the Brian Moretti Invitational, but it didn't stop R.I. athletes from turning him some stellar performance at Narragansett High. 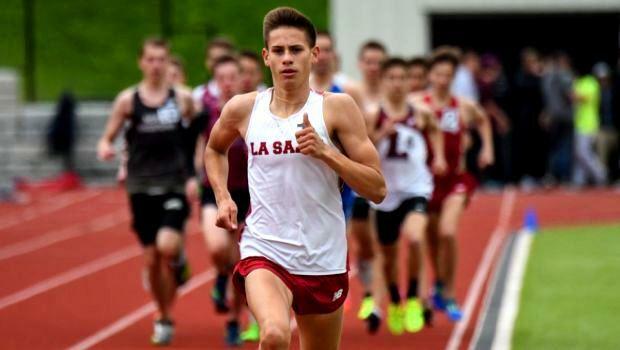 La Salle Academy senior DJ Principe easily won the 1,500-meter run. Principe finished with a nation No. 9 of 3 minutes, 54.60, a comfortable 14-plus seconds ahead of his closest pursuer. Central's Donatein Djero clocked a state and personal best of 48.50 to win the 400m. Teammate Dametrius O'Connor claimed the 200m title with a solid 22.2 clocking. The Knights were also first in the 4x400m (3:34.10) and the 4x100m (43.5). Bishop Hendricken, which won the team title with a 156-77 victory over runner-up Central, had a 1-2 finish from its top hurdlers in the 110m event. Joseph Rivera Santos claimed the top prize, while teammate Ethan Famiano took runner-up honors. Both were timed in a state best of 14.60. The Hawks also won the 4x800m with a combined time of 8:13.10.